Most criminal defense lawyers actually fear going to trial. Manipulating every client into a quick plea may easy and profitable for some lawyers but that is a dishonest and unethical way to conduct a law practice. A real criminal trial lawyer in Michigan will be known for his or her impassioned and powerful ability to communicate, their ability to effectively and cogently persuade the trier of fact, and their propensity to achieve extraordinary results. At LEWIS & DICKSTEIN, P.L.L.C., our expert trial lawyers are renowned for their prowess in trial and prosecutors and judges have been known to go to astonishing lengths to avoid going to trial with them. This means that cases that may be convictions with other lawyers are acquittals, dismissals or highly favorable plea bargains with LEWIS & DICKSTEIN, P.L.L.C. Because prosecutors and judges know that our criminal trial lawyers have no fear of taking a case to trial, we have the ability to secure plea bargains and sentence agreements than many other lawyers are just not capable of achieving. The prosecutor has no incentive to make a good plea offer or settlement agreement for a lawyer who has a reputation for pleading out all of his or her clients. They will know the lawyer is going to pressure their client into entering a plea even without a decent resolution. When a criminal trial lawyer in Michigan credibly threatens to take a case to trial, the prosecutor has every incentive to bend over backwards to achieve a resolution in a case…sometimes even an outright dismissal. The alternative for the prosecution is to risk the defendant’s attorney achieving an outright acquittal at trial (a result that many prosecutors sincerely fear). If you want the best possible plea bargain, you need a criminal trial lawyer in Michigan who is feared by the prosecutor and who maximize your chance of obtaining an extraordinary resolution. Michigan Criminal Law requires that the government prove every element of a criminal offense beyond a reasonable doubt. This rule applies whether a defendant is accused of a DUI misdemeanor, domestic violence, or a serious felony such as Assault, Murder, Drug Delivery. “Beyond a Reasonable Doubt” is defined as proof that is so strong that each juror has an “abiding conviction in the truth of the charge.” This means that each juror’s belief about the defendant’s guilt is so strong that he would not change his mind later that day, that week, or later than month. In argument, our trial lawyers make sure the jury understands extent of this burden and work to effectively discover the weaknesses in the state’s case. In Michigan, even if the juror feels defendant likely did it, but not beyond a reasonable doubt, he takes an oath to vote to acquit the defendant. Jurors frequently have difficulty understanding and applying this burden and it is the trial lawyers job to help the jury understand the significance of the burden of proof. Virtually every client desires to avoid trail and achieve a dismissal, plea bargain or lenient sentence. When a trial is unavoidable, we aggressively defend our clients to obtain jury trial acquittals. Our recent trial victories include numerous acquittals involving charges of domestic violence, armed robbery, DUI, felonious assault, fleeing and eluding, retail fraud and more. Taking a case to trial is not a decision to be made lightly and not something decided at the 11th hour.Effective trial preparation can take months. A veteran Michigan criminal trial lawyer will begin building a case for trial from the moment he or she takes the responsibility of representing you against a criminal charge. This does not mean that the case will go to trial, just that the lawyer will be in the best possible position to achieve the best possible outcome. Many clients do not realize that very few criminal cases that result in a trial and the reasons are relatively simple: Neither side wants to settle a good case and neither side wants to take a bad case to trial. In fact, less than five percent of criminal cases end up in a jury trial. If you factor out capital cases, the percentage is more like one percent. Often, the difference is in the investigative and legal skills of your lawyer and law firm make the difference. If, after a thorough investigation, your attorney decides you have a strong case, he or she will hold out for a deal too good to risk losing at trial. In the event that such a deal is not offered, a trial may be your best option. A qualified trial attorney will have conducted an independent investigation of your case; reviewed witness statements, evidence and other materials; and prepared your case for trial. The depth and breadth of the investigation is often commensurate with the complexity and seriousness of the charges. Jury selection requires a comprehensive review and extensive questioning of jurors. Many trial lawyers believe that a case is often won or lost before opening statements are ever made. And defense witnesses, experts and other professionals must be secured, prepared and scheduled to testify on your behalf. In very serious cases, mitigating circumstance regarding a defendant’s childhood and previous crimes may be presented and a detailed investigation must be conducted in order to properly prepare for trial. Hiring a criminal trial attorney in Michigan is one of the most important decisions you will every make and you will not get a second chance. At LEWIS & DICKSTEIN, P.L.L.C., we believe every defendant has the right to a skilled and experienced trial attorney and that is why we offer free and confidential appointments to anyone facing a misdemeanor or felony charge. 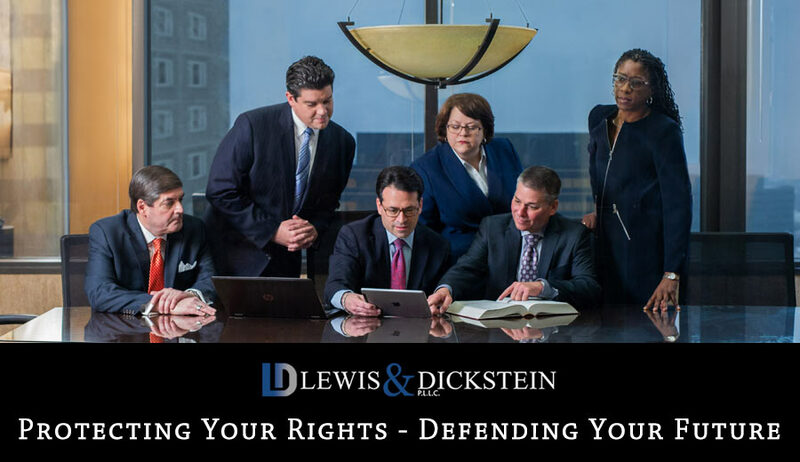 At LEWIS & DICKSTEIN, P.L.L.C., we have built our reputation on dealing thoroughly and fairly with each individual case. Our office does not take the obligation of representing a defendant at trial lightly. We have access to the investigators, expert witnesses, appellant lawyers and other professionals necessary to aggressively and effectively fight for your rights in the negotiating room … or in the courtroom. Sometimes in life you only get one chance to get it right. Call LEWIS & DICKSTEIN, P.L.L.C. today for a free consultation at (248) 263-6800 or fill out a Request for Assistance Form and a seriously experienced trial lawyer will promptly contact you. Whether your case is in Oakland County, Macomb County, Wayne County, Washtenaw County, Livingston County or elsewhere in Michigan, we will find a way to help you and we are not afraid to win!